Moving from one location to another has become quite a common thing where many people are travelling not just locally or interstate but even on an international level.However, good or bad, whatever the reason of moving be, the process of relocation is quite hectic especially when you have to sit and sort what things to pack and what not to. In fact, the majority of men and women find the whole moving procedure difficult and stressful and so they prefer taking the help of packers and movers. I personally feel this is indeed the wisest and the best thing one can do while relocating. But, I have also seen people who despite facing problems prefer doing their things on their own and I highly appreciate that. After all, it is best when you are self-sufficient and self-dependent. However, the problem occurs when you have got very less time like just a couple of days in hand to pack things and move. Now, it might not be that difficult for a professional moving company, but for a common individual like you and me, lack of time is a huge deciding factor. This is because you get very less time to actually think and execute everything. But, there is a saying that when there is a will, there’s a way and, in this context, you have to take up strategies to get your work done in such a short time all by yourself. And, to help you out, I have brought some essential tips on how to pack household in 3 days for do-it-yourself moving. See, 3 days, 4 days or 2 days is not the main factor here. I have used 3 days as an example. You may have got 4 days or 2 days in hand as well instead of 3 days. But, the main context here is lack of time and my today’s article is for those who got much less time in hand to pack and move but is still determined to do everything on their own. Strategic planning and execution is very important in moving no matter how much time, you have in hand. The only difference is that you have to act smart and execute things in a short period of time to get maximum profit and less loss. In other words, when you got so much less time like 3 days to pack and move, you cannot expect everything to be just perfect. In so much hurry, you are most likely to miss out things. For that you have to prioritize and let go of the less important things. This is just the basic thing. For more details, keep reading my post to know the tips on how to pack household in 3 days and move to a new place. I hope you are excited to know more, so without wasting much time, let us begin with our today’s discussion. If you plan to leave all of your existing belongings and buy everything new once you reach your new home, then moving becomes very simple. But, this is practically not possible as there are few essentials that must be carried, so that they serve your purposes immediately after you reach your new home. But, that also means you cannot literally carry everything to your new place, more so if you have just 3 days in hand until and unless you are moving at a really short distance. So, there are basic factors depending on which you must decide what to carry and what not to and my easiest steps on how to pack everything in 3 days for do it yourself moving will guide you in packing and moving. Since you are left with just 3 days time, you should not be waiting to get started. There is no point wasting time, because packing itself is going to take lots of time and efforts. It is best to start planning and packing household items that is to be packed and moved, immediately. You must dedicate few crucial hours planning and sorting the things to carry (and discard) and then get started with the process of packing. There is no point in carrying all the items and considering the less time you have, you won’t be able to do so much of packing in a short span of time. Moreover, the less number of items you choose, the less time you will have to invest to prepare them for shipping. Now, there are few parameters based on which you can sort out which items to carry and what to discard and leave behind. The essentials are the items which you must never miss out. These includes some of your clothes, mobiles, chargers, medicines, important documents, basic cooking utensils, some cash etc. Items that carry sentimental value also has a lot of importance. Now, if you have special memories attached to a particular item, I think you must carry those. This is because such items are priceless and cannot be replaceable. The condition of the item you plan to carry is another important deciding factor. Now, there is no point in carrying something that is too old, or ill-fitted or tattered and torn. Carrying these stuffs is a waste as you will be hardly using these items in future. So, it is better to buy new items in that place and discard the old ones. Things that are rare and antique are of great value and so you may carry them to your new home. I have discussed the basic parameters based on which you may decide which item to carry and what not to. Now, make sure you note down the list while you sit down to plan and think. This is because in a hurry, you are most likely to forget things and so writing the things in a piece of paper will help you immensely. Before you start packing, you need to have your packing materials ready. Go to the market and buy all the basic packing stuffs. There are separate stores as well that supply you with the packing necessities, sometimes second-hand items as well. These generally cost less in comparison to buying new packing materials. However, no matter how less you invest in it, you have to make sure that despite having less time, you cannot compromise with safety. So, try to find packing materials of good quality, the one that’s strong enough to protect your valuable household goods and appliances. Buy boxes of several sizes, wrapping paper, tapes, foam and other such materials for cushioning, etc. You may also take the packing boxes from any of relatives, neighbors or friends who have recently relocated, but just ensure that it is in good shape. Once you are done with the planning of what to carry, start sorting out the things. Sort one room at a time and keep the items in a common space where you have decided to pack your items. This is important and will help you pack fast else you will yourself forget that where you have kept the sorted things and ultimately you will be in a mess. The discarded items which are not worth taking must be kept separately and they must not in any way mixwith the items you are carrying. Generally, selling the items that you are not carrying is the best option to do but considering your lack of time, that seems to be a very difficult choice. But, you may still contact any nearby store who buys such second-hand stuffs. Maybe you will not make any profit but at least you will get toearn a little in the process. And, if selling is not possible in any way, you may ask your neighbors, friends and other known ones to take the things in casethey are OK with it. In fact, they may be open to paying you some moneyas well. The other option left is to give things away free to someone or donate to charity. And if none of the above is possible, simply throw the stuffs away. Since you really have less time to pack so many things, you can actually take the help of your close friends and relatives in packing. It is going to be much faster than you alone packing all the things and will thus reduce your pressure. You may also take advice from them how to pack things effectively in case anyone is an expert in it or has got prior experience packing and moving. It is very important to keep aside the essentials before you start with the packing and not let it mix with the other things you are carrying. This mainly includes the items that you need until moving day, on moving day, while travelling and also in the initial days in your new home. The reason I am telling to keep such stuffs aside and carry these with you is that shipping might take a few days and so if the essentials are kept there, you will face a lot of difficulty. Generally, it is best to take proper note of all the items specifically that you are carrying. This is important and helps you track things if you misplace something. It is best that you click photos of all the items you are carrying and in which bag probably you are placing them. This will help you keep a track of all the things as well it will save a lot of your time. Once you are ready doing the above things, you may start with your packing. You need not waste much time properly folding the casual dresses and instead use nice garbage bags to keep them. As far as the other delicate things are concerned, be careful with those. Use strong boxes and proper cushioning to protect them from breaking during transportation. The tapes used must also be strong so that they do not tear easily. You do not have much time in hand and so you must set a proper time limit within which you have to complete with the packing. This is a kind of challenge that you have to take and trust me, setting your own goals in most cases, actually work and give you the motivation to get everything done within time. I sincerely hope that this applies for you too. As you conclude the packing, it’s time to label each of the boxes with the contents it has. Also assign a serial number to the box, so that you have the exact count. Remember to put serial number on each and every packed boxes and luggage, so you don’t miss out on anything. As you have understood the basic steps of packing, you need to be careful about how you are using your time. Since you got just 3 days in hand, you will have to divide the work accordingly. This is important so that you do not feel too much pressure at the end. So, here’s how you can divide your work into three days. It is best to do all kinds of planning and plotting on the first day and that will help you execute the plans properly. So, dedicate few hours to planning which will include the basic listing of things that you want to carry. This will help you sort the items better. Besides that, you also need to arrange for the transportation of your goods from beforehand. If you have already done it from before (which is actually preferable) then that is great but in case you haven’t then try to arrange it on the first day. This is because arranging for the transportation is mandatory and keeping it for the last day is risky. If you are transporting locally, then you can arrange a truck and shift your things to your new home. In case you are shifting interstate, it is better to hire a professional movers and packers company. Although it is little difficult to get good service providers at such short notice but if it is an off season then you can get one easily. In a pick season you can also get but in that case, you may have to pay little more. There are several online platforms including ServiceSutra that connects you with trusted companies within short time as well. You may request for free estimates by submitting the quote request form. Usually movers and packers offers end-to-end service, which includes packing, loading, transporting with insurance, unloading and other value added services. But you can skip packing if you have done it on your own and naturally, the cost will also go down. Once your problem of transportationgets sorted try to arrange for the packing materials as that is very much needed before you start packing. It is better that you buy the things in more numbers in case you need them more and also remember that the quality must be good in order to ensure the safety of the items. After that, start sorting the things that you want to carry. Pack one room at a time and keep all of them in one room where you will sit and pack. If you can complete sorting on the first day that is good else continue that on day2. Complete the sorting process and once you have done it, start your packing. Since you will have all of your items ready in one place and also the packing materials, packing will hopefully be quick. You may take help from friends and family, to finish the packing faster. Remember to keep the essentials aside or place them in a bag that you will keep with you all the time. The essential bag may contain keys, medicines, emergency kit, first aid kit etc. In the meantime, you may follow up with your movers regarding the transportation (with loading, unloading and transit insurance) and in case you yourself have planned to arrange, keep track of that as well. Since it is the last day, I generally do not prefer keeping things for the last minute. This is because you have very less time and, in all probability, you won’t be able to complete everything within 2 days and so naturally you will have the remaining works to do. So, basically whatever is left try to complete those in your 3rd day and wrap things up as fast as you can. Check thoroughly whether everything is OK and you are not missing out anything. After that, it is best for you to take little rest as the next day you will have to travel. 3 days is quite a less time to plan and pack your entire house, but if you are smart and act strategically then you will be able to achieve things as per your deadline. I have already given few tips on how to pack everything in 3 days for do-it yourself moving. You may follow these best practices and you will be able to get it right, even in 3 days. The guidelines I gave are basically from a general point of you and it will help majority of you. But exceptional cases may be there and you may have to do something extra as well, but that will depend on the situation and accordingly you can act. So, do not worry as the tips I gave will give you an idea regarding how to plan and pack everything in less time. That time may vary from person to person but the basic things will be the same. The only thing is you will either get some more time or less time to plan and execute. So, are you ready for the challenge? 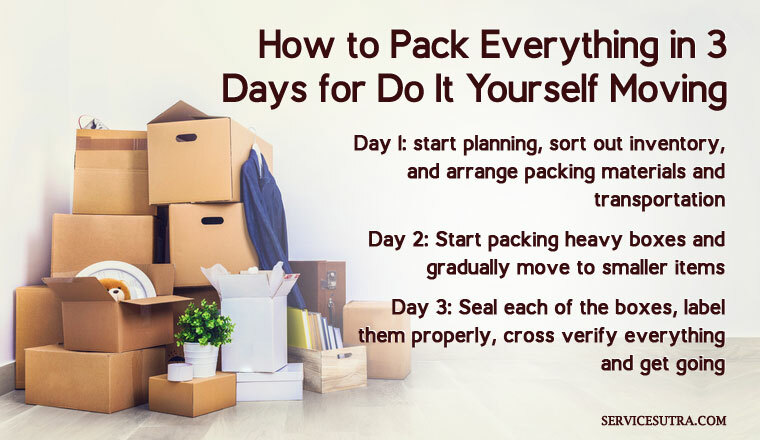 Then try some of the essential packing tips as discussed above and get relocated within 3 days. If you have relocated on such short notice and have any tips and ideas that can improve the efficiency, then feel free to share by commenting below. What else do you think one should do while packing and moving in such a small span of time? I am fascinated. I do not think I’ve met anybody who knows as much about this as you do. Thanks for sharing these packing tips. Many thanks for sharing this post. It is filled with so much helpful information on packing and relocation. I am planning to move next month and this is going to help me a lot. Good post. I like this post so much. I was very lucky to discover your website. It’s got a lot of useful info and i hope you publish more such posts!